We’re always banging on about how Stone-Age man and the Ancients knew more than we give them credit them for, but who would have thought their early technology could be the basis for the next generation of hydrogen-powered cars? And even, perhaps, water-fuelled vehicles one day soon? It is possible. According to our speaker, Steve Hawkins from the Dorset Earth Mysteries Group, water could be the ‘coal’ of the future. There was a water-powered prototype car in 1860 which used electrolysis to create power on board. Take the pyramids. The ‘experts’ would have us believe there were 100,000 slaves hauling massive stones into place, up ramps, spurred on by their overseers. If you work it out, that means it would have taken hundreds of years to build just one pyramid. Oh, and it had to be accurately aligned with certain stars, and north-south too. Each stone block is accurate to one-fiftieth of an inch. (America’s Empire State Building is built to a quarter of an inch tolerance.) There are 33 limestone quarries in Indianna; if all 33 of them went into full production, it would take 27 years to quarry enough stone for just one pyramid. And then there’s delivery to worry about. Edward Leedskalnin (1887–1951), a Latvian jilted on his wedding day who took his broken heart to Florida, claimed to know the secrets of building the pyramids. (They certainly weren’t tombs, as we have been led to believe.) Leedskalnin built Coral Castle – single-handed – as a shrine to his lost love, and managed to move rocks weighing as much as 30 tons, overnight, alone and unaided. 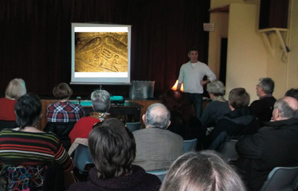 Some believe moving such massive stones was done by levitation, aided by singing and chanting, but our speaker suggested the ancients had electricity. There are several granite stones in the King’s Chamber of the Giza Pyramid in Egypt that might well be a generator – a sort of Giza power plant. 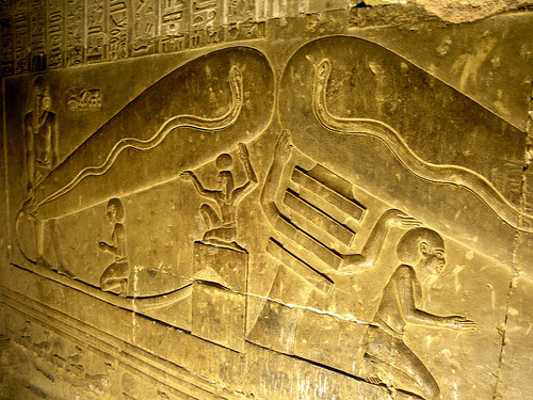 Ancient carved illustrations found in the Dendera Temple, Egypt, appear to show lightbulbs, complete with power lead. The Egyptians certainly had gold plating, and in 6000 BC the Sumarians were silver plating pottery, both of which are an electrolytic process. How could they do that without electricity? A jar found near Baghdad between 200 BC and AD 200 was an early form of battery, which produced voltage if fruit juice or vinegar were added. There is no build up of soot in the pyramid’s shafts and tunnels, which you would expect from oil lamps. So they must have had clean power too. In the 1970s, Bulgarian Yull Brown produced Brown’s Gas, an invention that allows oxygen and hydrogen extracted from ordinary tap water by electrolysis, to be used for many things, including cutting, heating and welding. It is suitable for cutting tungsten and crystal, two of the hardest substances known to man. There is so much other evidence that shows this process too was almost certainly known to the Ancients.